Spend Up to $350 - Pay $20 or Less a Month! Gettington has over 350,000 items in their online catalog with up to 40% off comparable products on select items in The Outlet. Shop home, clothing, fitness, beauty, tools, baby, kids, toys, video games, electronics, automobile, and gifts. 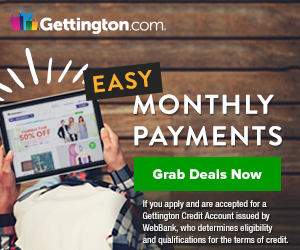 Click to apply for a Gettington Shopping Credit Account. With your account you could purchase $350 worth of merchandise and only pay $20 or less per month. With such a variety of products, this will come in handy for birthdays, holidays, and emergencies like when something breaks out of nowhere (they even carry home appliances like air conditioners).